African Americans: African Americans are an ethnic group of Americans with total or partial ancestry from any of the black racial groups of Africa. The term typically refers to descendants of enslaved black people who are from the United States.Black and African Americans constitute the third largest racial and ethnic group in the United States (after White Americans and Hispanic and Latino Americans). 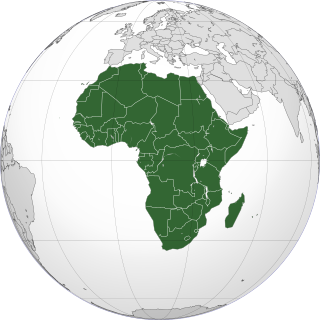 African Union: The African Union is a continental union consisting of 55 member states located on the continent of Africa, with exception of various territories of European possessions located in Africa. The bloc was founded on 26 May 2001 in Addis Ababa, Ethiopia and launched on 9 July 2002 in South Africa. African wild dog: The African wild dog , also known as the painted hunting dog, painted wolf, African hunting dog, Cape hunting dog or African painted dog, is a canid native to sub-Saharan Africa. It is the largest of its family in Africa, and the only extant member of the genus Lycaon, which is distinguished from Canis by dentition highly specialised for a hypercarnivorous diet, and a lack of dewclaws. African National Congress: The African National Congress is the Republic of South Africa's governing political party. It has been the ruling party of post-apartheid South Africa on the national level, beginning with the election of Nelson Mandela in the 1994 election.